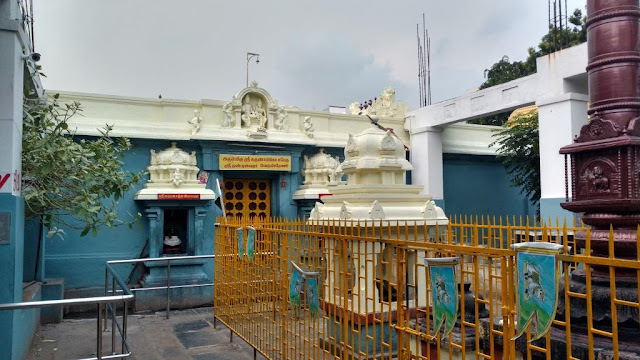 Karunambika Sametha Dhandeeshwarar Siva temple in Velachery is a Swayambu linga temple on the banks of Yama theertham and was worshipped by Yama Dharma Raja to regain his Dhandam or weapon known as "Swarna Dhandakasam" as detailed in Agasthya Vijayam, the monthly spiritual magazine. 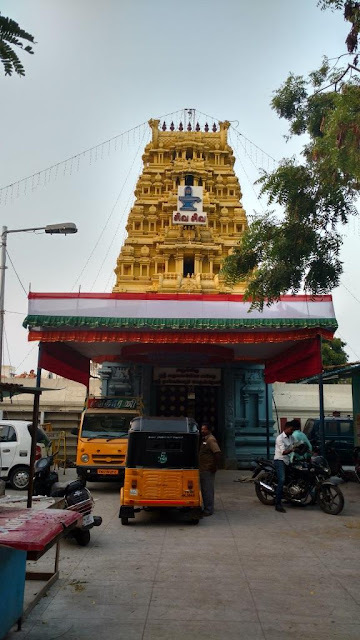 Yama Dharma Raja is one of the Ashta dik palakas incharge of southern direction. In Bhooloka, all living and non-living things are subject to creation and destruction. There is no permanent member who can live eternally in bhooloka. 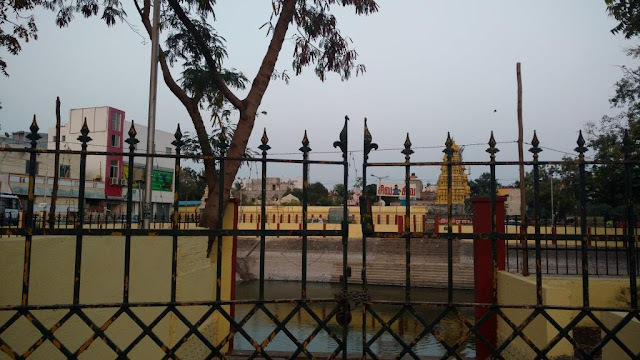 Even avatara purusha like Krishna Paramaathma left his mortal body after being struck by an arrow of a hunter in Prabhasa Kshetra in Gujarat and returned to vaikuntam. 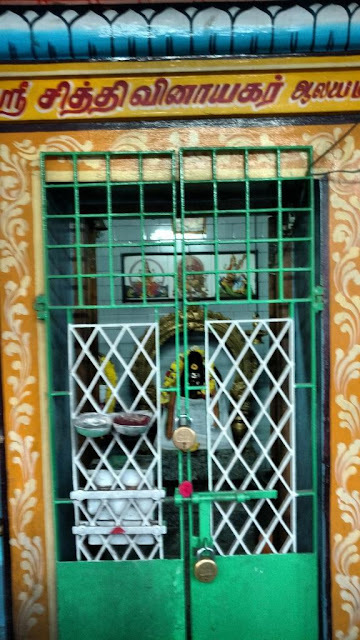 So, Yama Dharma raja is incharge of the divine activity of separating the soul of all beings from mortal body in bhooloka according to their fate. This would help the soul's evolutionary process and enable the person to move to the next level according to the paavam or punyam committed by the person. Markendeya maharishi's fate destined a life span of 16 years to him. 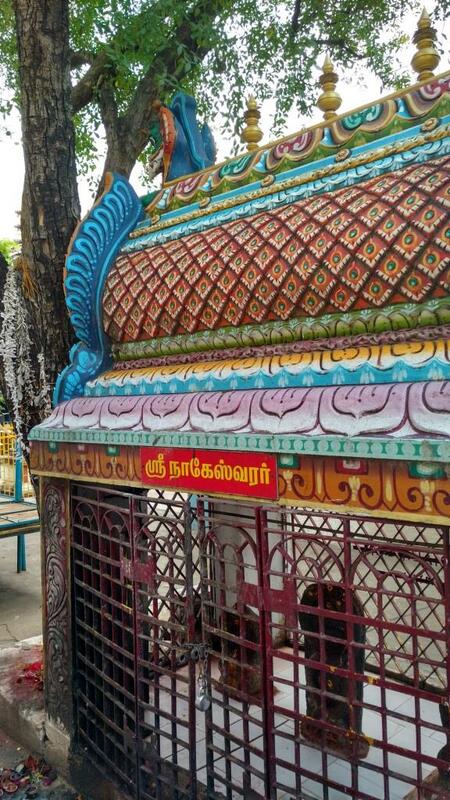 He was the son of Mrikandu maharishi who advised him to do the shiva pooja .On the day he completed 16 years, Yama Dharma raja arrived near Markendeya maharishi to take the life as destined by fate. Markendeya maharishi ignorant of yama's arrival was engrossed in Shiva linga pooja. 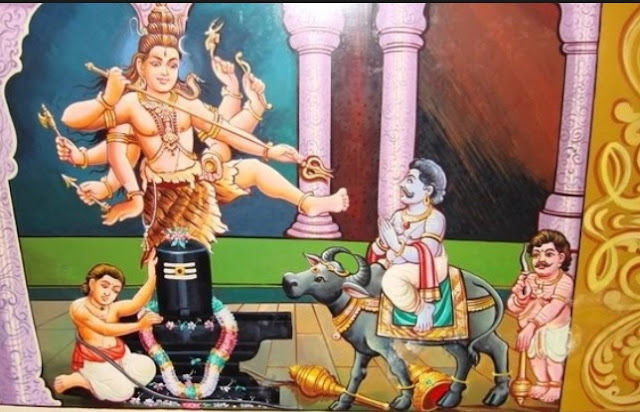 Lord shiva became angry that yama was trying to disturb the shiva pooja of his devotee Markendeya. He manifested in the shiva linga and punished yama dharma raja for disturbing shiva bhakta. 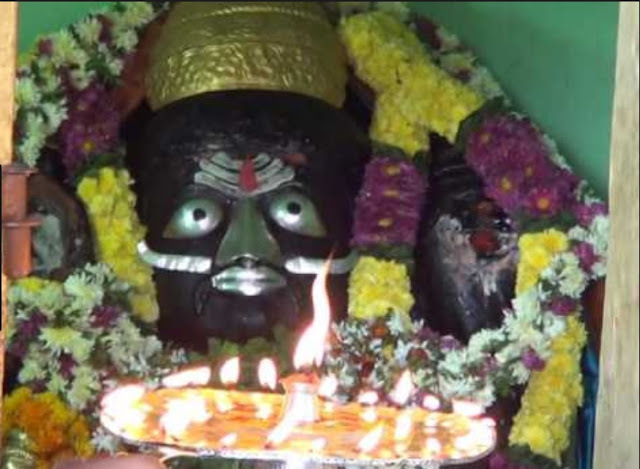 Yama dharma raja lost his weapon or dhandam known as Swarna dhanda kaasam during the process. Yama dharma raja worshipped Lord shiva on the banks of Yama theertham here in Velachery to regain his weapon or dhandam. 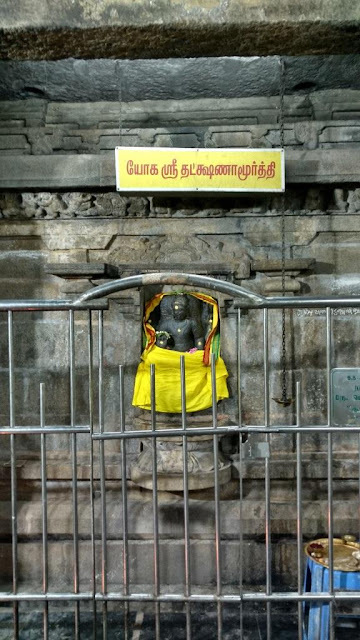 Lord shiva pleased with the penance of yama dharma raja, manifested himself and gave back the weapon Swarnadhandakaasam to him in Velachery temple. Hence Lord shiva is known as Dhandeeshwarar here and faces eastern direction. 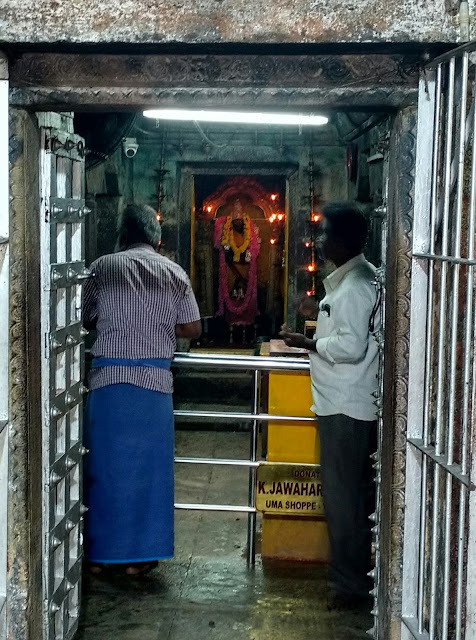 Parvathi devi is known as Karunambika here and faces southern direction. Southern direction is the direction of Yama and pitrus or ancestral beings. So, worshipping Velachery Dhandeeshwarar temple blesses devotees to remove Apa Mrithyu dhosham or remove fear of unnatural death in accidents, intensive medical treatment failures etc. Agasthiar.org details that Devi starting with the word 'Karuna' and facing southern direction blesses us and removes pitru doshas. Blessing of Pitrus or ancestral beings helps our family and children to lead a righteous and prosperous life. 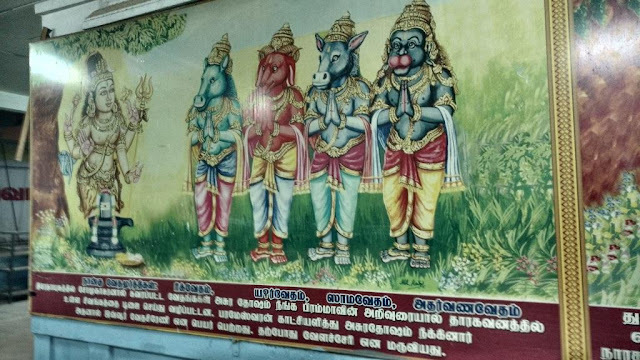 Velachery temple has Vinayaka in unique forms. 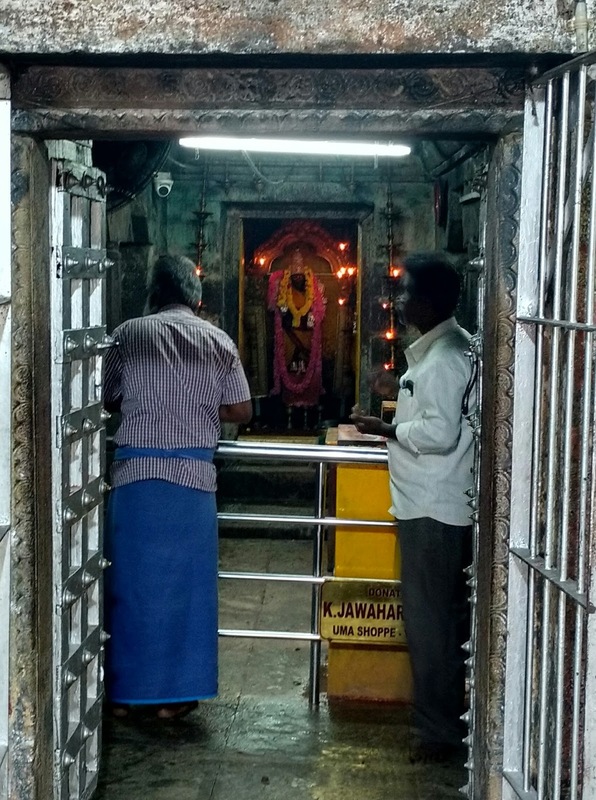 As we enter the temple to our left is the shrine of Vedha Vinayaka. 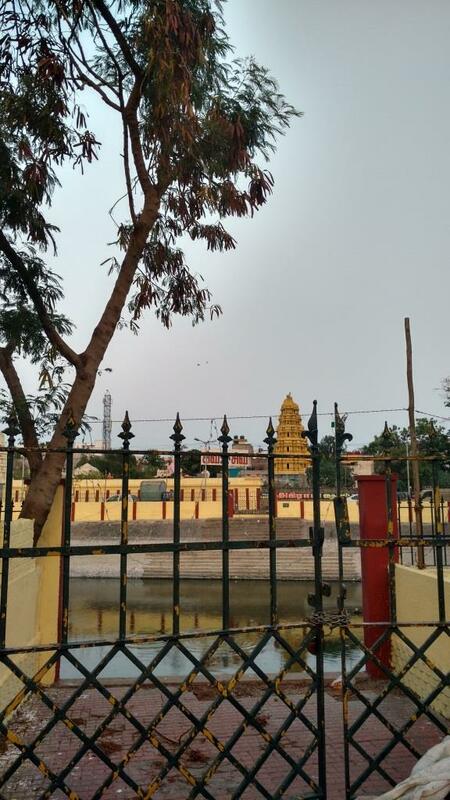 There is also two other vinayaka sannidhi who is incharge of morning, afternoon and evening periods known as Kalai Sandhi Vinayakar which is a unique feature. 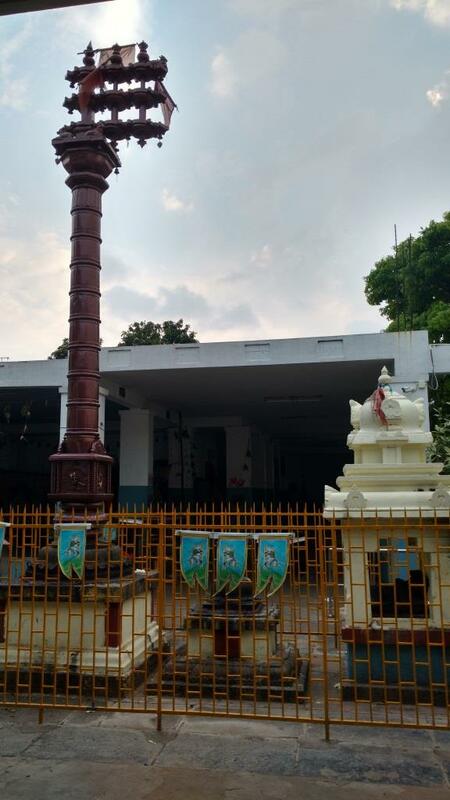 Vedhas, when they were under the control of Somakasura had a tinge of asura pravriti owing to association with asura. 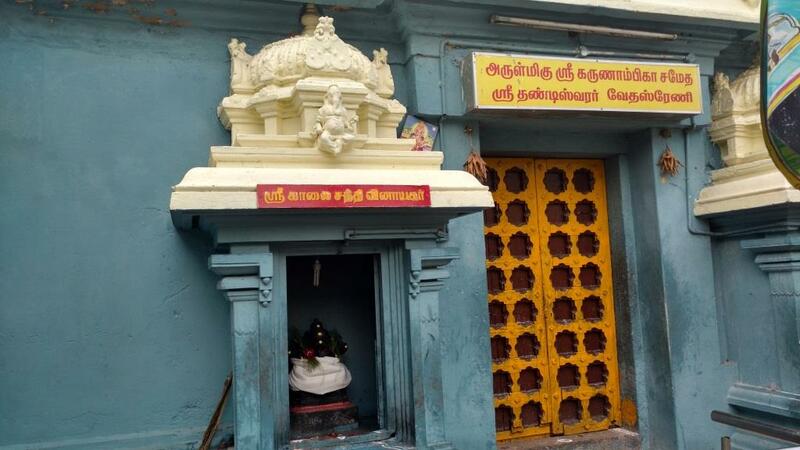 Hence, Rig, Yajur, Sama, Atharvana vedhas have prayed to Lord Shiva here to regain their original glory and form. 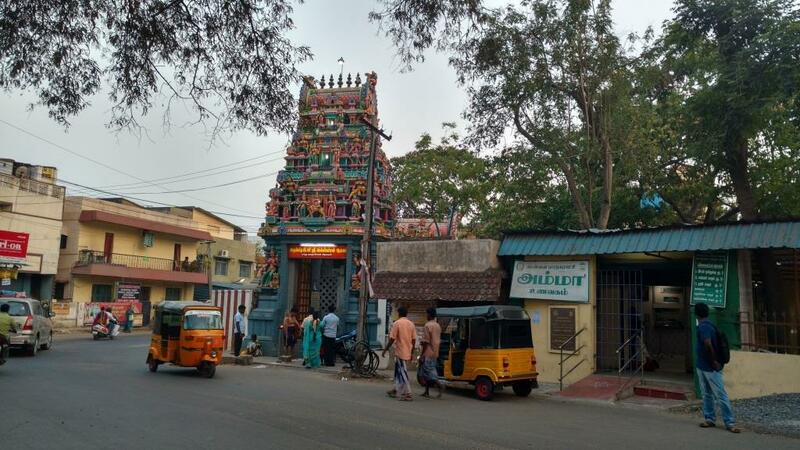 Hence, this place was known as Vedhasreni and the word got colloquially mispronounced as Velachery. 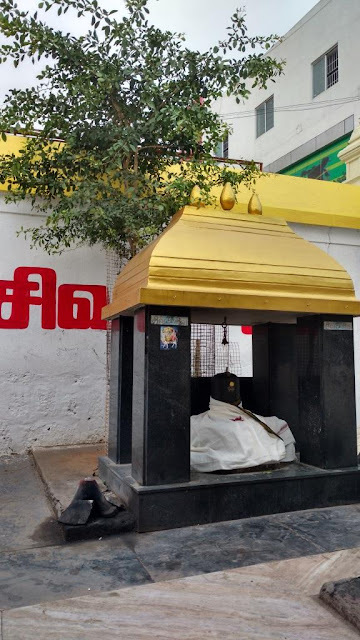 In the outer prakaram of velachery temple, one can see Vaidyanatha shiva linga under vilva tree and naga prathishta under vilva tree. There is also sannidhi for Meenakshi Sundareshwarar, Saraswathi, Brahmadeva, Mahavishnu, Mahalakshmi, Lingothbhava, Bairava, Durga devi and Nataraja. 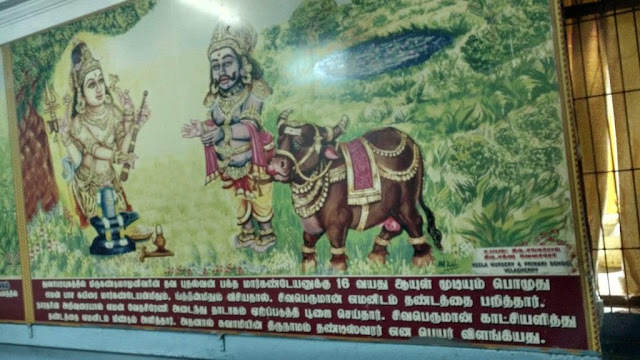 There is a unique sannidhi of Yoga Dhakshinamoorthy in yogic posture in Prakaram. There is also a sannidhi for Sambu surya in this temple. 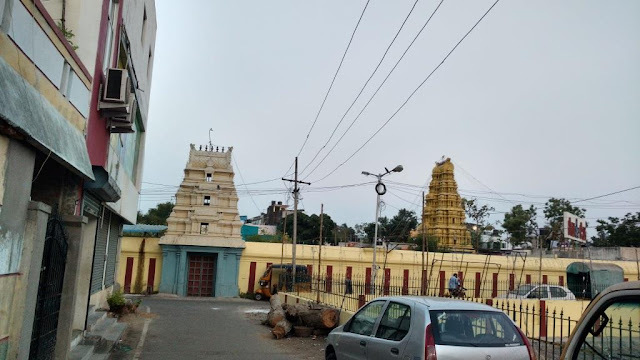 Benefits of worshipping in Karunambika sametha Dhandeeshwara temple. Removes pain associated to terminal illness like cancer, stroke, brain or important organ failure in the last stages of life and ensures longevity of life or peaceful death whichever be the form of blessing from God. 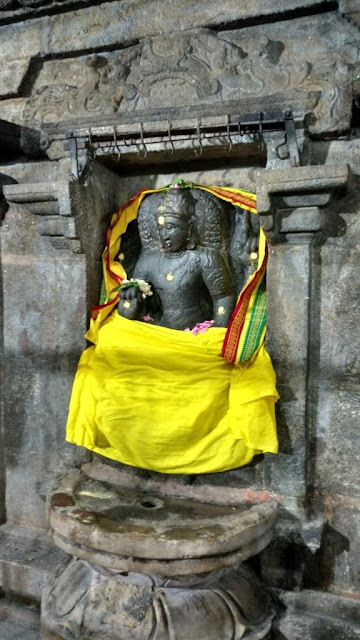 Since the rare Yama theertham is found here and dhandeeshwara is also swayambu linga moorthy, all moorthy, theertham, sthalam factors strengthen the prayers of devotees here so that they receive immense blessings.